Covent Garden’s theatrical legacy has a rich background and today it is the centre of what is called London’s “Theatreland,” a title it has claimed since the time of Charles II, as within walking distance of its boundaries are thirteen distinctive theatres. Covent Garden itself has four theatrical epicentres: St. Paul’s Church, the Royal Opera, the Theatre Royal and the Lyceum. St Paul’s Church is not a theatre, but it characterizes Covent Garden’s connection to the theatre world by being well-known as “the actor’s church.” The funerals of actors and stage crew are, and have been, held there for years. Famous actors throughout the years are memorialized on plaques in the church’s interior. This is unsurprising given its proximity to so many theatres, the closest being the First Theatre Royal and the Royal Opera. 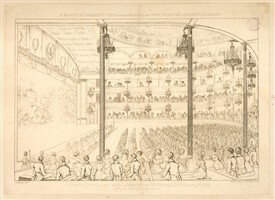 Interior view of the Theatre Royal, Covent Garden, during a performance. Drawing by G. Argenzio; etched and engraved by Heideldorf. 1810. The First Theatre Royal of Drury Lane is actually the oldest theatre site in London, but its current incarnation was built in 1812. Following their victory in the English Civil War, in 1651, Oliver Cromwell’s puritanical government banned theatrical performances on grounds of frivolity, something King Charles II lost no time rectifying in 1660 when he was restored to the throne. Subsequently, in 1663 he issued letters patent for the construction of a new theatre in Covent Garden: the First Theatre Royal. Curiously, this patent made it one of only two theatres in all of London allowed to perform spoken drama, though this was mostly ignored by the other London theatres. As was the case with many theatres, vulnerable to fire, the Theatre Royal was destroyed and rebuilt three times. 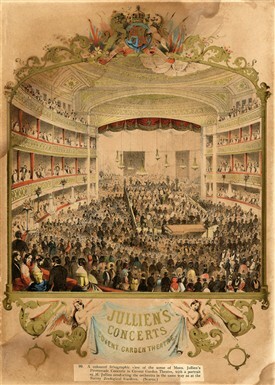 Print of M. Jullien conducting his orchestra at the Royal Opera House. 1864. The Royal Opera, on the other hand, was not built until 1732 (at which point it was simply called the Covent Garden Theatre. The name changed when tastes shifted from the theatrical to the operatic soon after), but like the First Royal it was given letters patent granting a monopoly on spoken drama. Because of this, the two venues were in constant competition. Often referred to simply as “Covent Garden,” the Royal Opera, as if challenging the First Royal’s own self-destructive track-record, was also destroyed and reconstructed three times. Lastly, the Lyceum Theatre on Wellington Street, though not so prestigious as the other two, soon came at least to rival them. It was not until 1809 that it became a legitimate theatre when, following a fire at the Theatre Royal, its resident band of actors, the Drury Lane Company, relocated there. The Lyceum skillfully overcame the restrictions imposed on performances using the spoken word by ensuring that all of their performances contained just enough music to stay within the letter of the law. Just as with today, theatre was an important feature of London life. People often exhibited their willingness to protect this lifestyle and where the law prevented them from enjoying a good show, as in the case of the old Cockpit, they found ways to circumvent it. Magistrate's response to Price Riots. They had to deliver it from a stage to a chorus of disapproval. 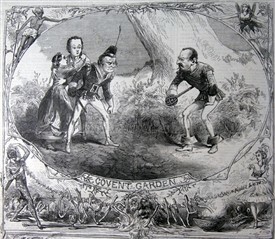 Satirical cartoon, reproduced in Old Theatre Days and Ways by W. J. Lawrence. 1809. Sometimes enthusiasm for the theatre was unreasonably violent, and the instance of the Price Riots perfectly illustrates this. 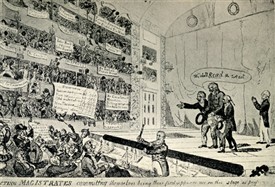 In 1808, when the Covent Garden Theatre burned down, ticket prices had to be raised to compensate for reconstruction costs. Outraged theatre-goers reacted by stationing themselves outside the building for sixty-seven nights, protesting the new prices in what came to be known in the newspapers as the Price Riots. Though the demonstrations were eventually broken up for being in violation of the Riot Act, the prices were eventually dropped. People in the acting community itself were an eccentric bunch. In 1735 the actor John Rich, manager at the Theatre Royal, Covent Garden, along with several dozen other members of the theatre community, established the Sublime Society of Beefsteaks in Covent Garden. The idea behind the society was to celebrate the beefsteak as a symbol of Englishness, and to convey their patriotism, the “beefsteaks” would meet weekly at a Covent Garden theatre to eat vast quantities of beefsteak, often accompanied with alcohol and potatoes. The original society lasted until 1867 and in its long life made members of many famous individuals, including William Hogarth and the Prince of Wales. The Sublime Society of Beefsteaks is one of London’s oldest and most-respected clubs, and even has a modern incarnation that still meets today. As is the nature of popular entertainment, the theatre propped up many idols in London society; actors and actresses beloved for their prominence, skill and beauty. 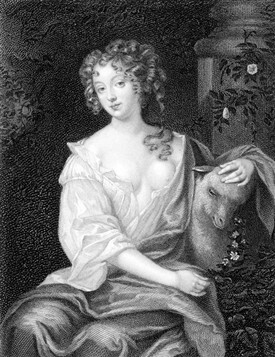 The actress Nell Gwynn was arguably the most famous of the acting icons of Covent Garden stage. She lived and acted in the late 17th century, starting out as one of the theatre’s scantily-dressed orange-sellers at the age of fourteen. Nevertheless, she attracted attention with her strong personality and clear voice; her skill was cultivated by several interested teachers, and she was eventually lauded for her prowess in comedy acting. Finding success despite her humble roots, she went on to become the mistress of King Charles II, and bore him two sons. Nell Gwynn was hailed as a local folk heroine for her rags-to-riches story, retaining her low-class wit and attitude despite the high-class accoutrements of her later life. David Garrick, born in 1717, was an actor whose career centered on the Theatre Royal, Drury Lane. He was especially notable not only for his popularity, but his influence on the way theatres operated at the time. His acting was realistic; appealing to audiences tired of traditional long-winded styles, and encouraged other actors to do the same. In addition, though his skills as a playwright are not remembered fondly, his amendments to Shakespearian scripts attracted new audiences to the theatre, making the bard more accessible to younger people who could not quite follow what was being said. He died in 1779, and was buried in Poets’ Corner in Westminster Abbey. In 1831, the Duke of Sussex had built the Garrick Club, intended for patrons of drama, in his honour. It is still there today, located on Garrick Street, also named after him. Ellen Terry’s fame has endured as a master of her craft. She was the leading Shakespearian actress of her time, famous from 1874 until 1920 for her Shakespearian roles. Fittingly for such a prominent actress who made her name in Covent Garden, her ashes remain close to where she plied her trade in St. Paul’s church. From his first appearance in England, Mr. Punch’s performances were soon drawing large crowds. One of his earliest fans was a certain Samuel Pepys who recorded that on 9 May 1662 he had been 'mighty pleased' by an Italian puppet show near St. Paul's Church in London's Covent Garden, and it is from this entry that Mr. Punch's 'birthday' is now traditionally calculated. Today the Punch and Judy show is commemorated on a pub sign in Covent Garden, and many consider the modern street performers to be the figurative inheritors of Punch and Judy’s legacy.